Ice Nine Online built a company Intranet with numerous functions for V3, a top international engineering firm. V3 Companies can be described in many ways: Most simply, they are a multidisciplinary firm offering civil engineering, contracting, environmental, planning and surveying services. Since their founding in 1983, V3 Companies has adhered to four fundamental core values. Unwavering integrity that includes honesty and transparency in their communications and business endeavors. Commitment to excellence by efficiently providing high-quality professional services. Focus on clients and the importance of doing all they can to achieve their objectives. Dedication to employees and the understanding that their people are their most valuable asset. V3’s cultural foundation was built and nurtured with these core values as their guide. 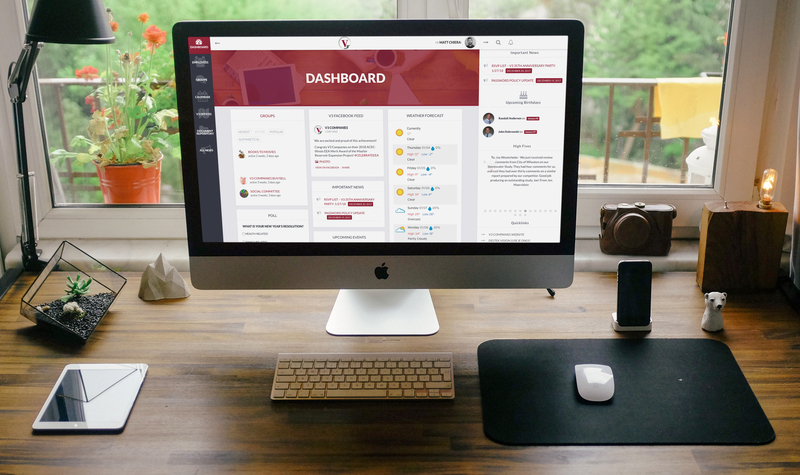 V3 needed a custom company Intranet to be used as a portal for team members. The Intranet was meant to facilitate communication, provide access to key company info, alert team members to company news and milestones, and act a central repository for company documents and collaboration tools. Groups i.e. Runners Group, Movie Lovers, etc. “Effective project management is one of Ice Nine Online’s key strengths. They listened to our needs and took our priorities into consideration when designing the platform. Their expertise helped steer us in the right direction. We had a couple of initial meetings to discuss schedules and milestones, and Ice Nine Online’s thoroughness ensured we hit ever deadline. Let's discuss your project during a zero-obligation consultation "Discovery Call."